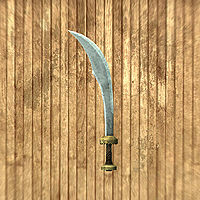 Windshear is a unique Scimitar which can be found lodged inside of the bowsprit of The Katariah. 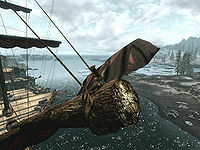 As The Katariah cannot be accessed until the quest Hail Sithis! has begun, this weapon is similarly impossible to acquire until that quest has been started. This means that the weapon is unavailable if you decide to complete the quest Destroy the Dark Brotherhood! instead. Windshear's unique enchantment causes its attacks to stagger an opponent when hit and causes its bash attacks to paralyze them for a tenth of a second. As the enchantment only works for its bash attack, the enchantment will not work if a spell or another item, such as a shield or secondary weapon, is being held in the other hand. Tempering Windshear requires a steel ingot and the Arcane Blacksmith perk. The benefits of tempering Windshear are doubled if the Steel Smithing perk is unlocked.